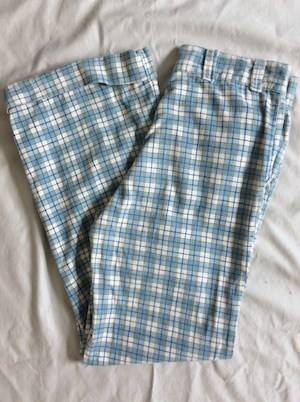 Mens Vintage 1970s disco pants! 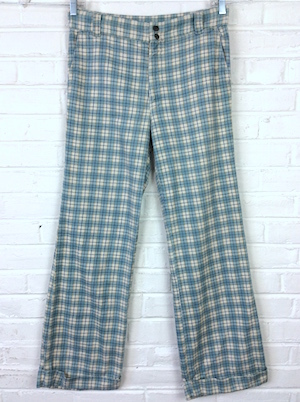 Funky and super soft brushed cotton plaid pants in white, gold and shades of blue with cuffed BELL BOTTOMS! Closes in the front with two brass toned snap buttons, just above the zipper. 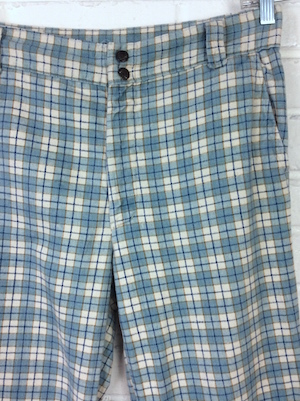 Two classic pockets in the front and two interior pockets in the back, one with a button closure. Has extra long and thick 70s belt loops. Tagged by Jeans West U.S.A.. No material tag, but feels like cotton. Condition: Very Good. Has a small pull in the upper back of the pants. Does not detract from the awesomeness of these pants. Inseam: 32" w/ just over 3� hem when cuffs are let down. Rise (waist to crotch) : 11"